I started this project back in May (or maybe June?) I knew it would be a slow-burner that I took my time with. I really like having a project like that always going on in little chunks between the other things I finish more quickly. It's soothing and satisfying and eats thru the ever-growing bags of scraps. This one is just for Ruth. Ruth was one of my very best friends from 7th-12th grade. She is one of those people who everyone loves, and I was lucky enough to hang out with her constantly during my formative years. 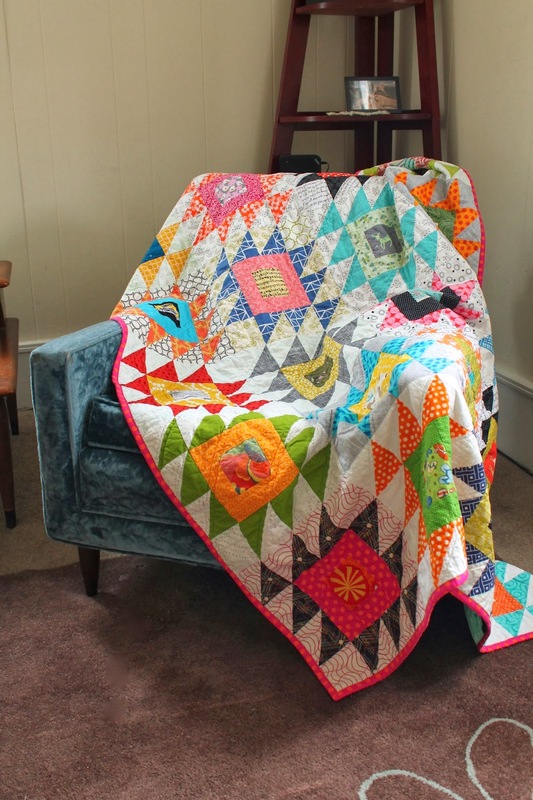 She was a big fan of the scrappy + & x quilt I made last year so she asked me to make her a crazy colorful quilt like that. For her? Of course. 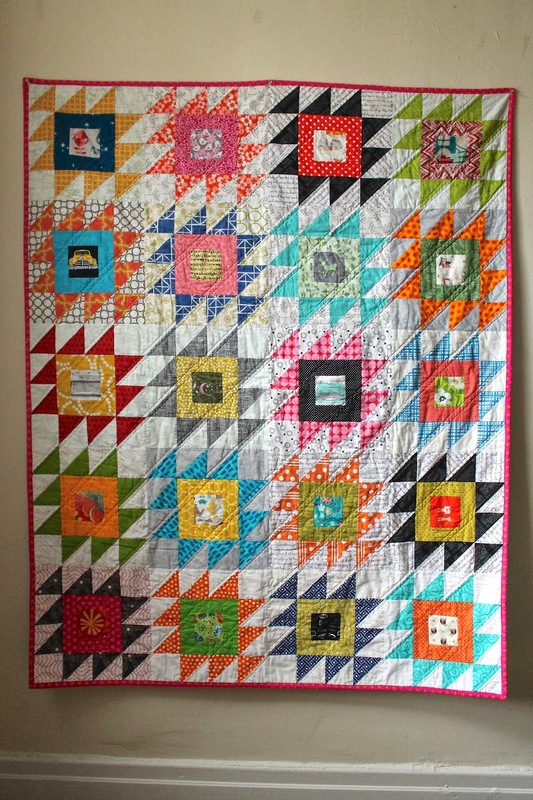 The block design is from Elizabeth Hartman's first book, Practical Guide to Patchwork. I just treated each block as it's own color story and pulled fabrics from my scraps, trying to use a variety of values for the backgrounds and star points. I also put my flying geese for each block together using the no-waste method instead of the traditional way. I was always especially excited when I got the directional prints to all point the right way using that method. Like those lions. Geese victory! 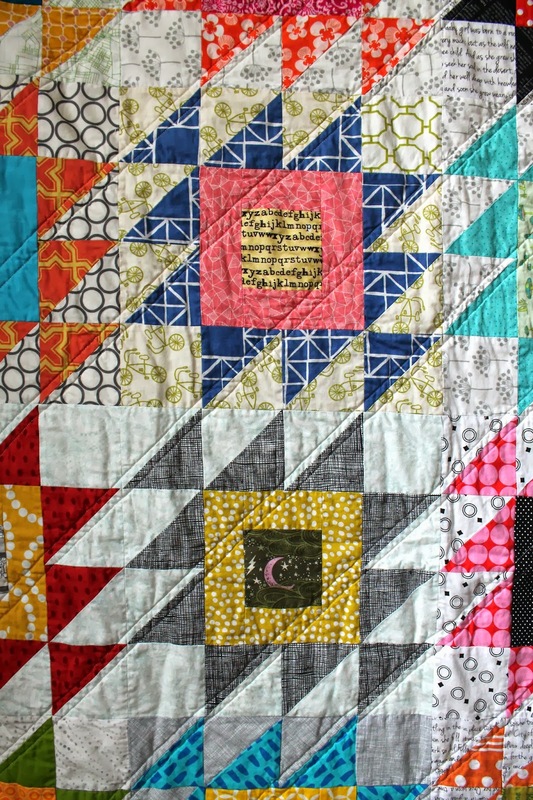 The backing fabric is not the most original choice these days, but it's just too perfect for a scrappy quilt like this. The large script print is from Ikea and looks so striking on the back. The quilting is just dense straight lines made with my walking foot, about 1/2" apart. The feeling and look of that quilting is always worth the extra time to me. I took these pictures before washing the quilt, but man-oh-man was the crinkle awesome after I washed it. 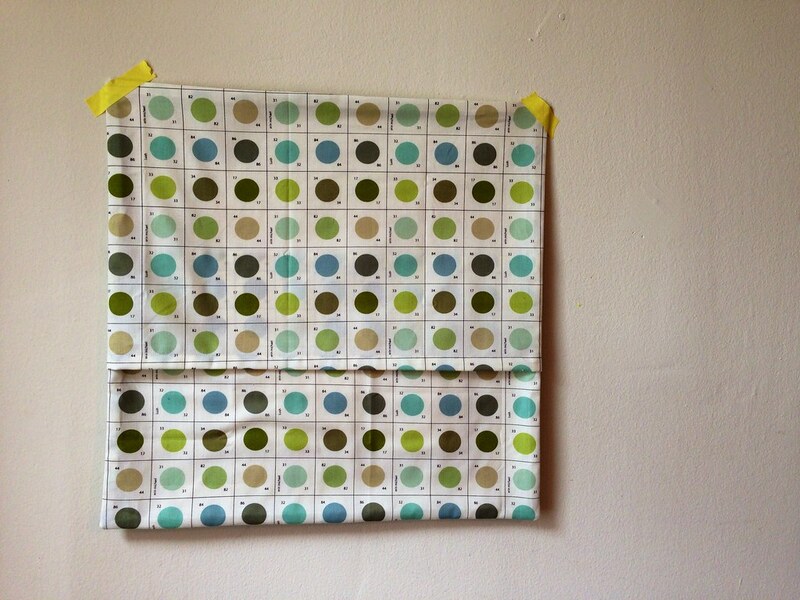 The binding is Domino Dot in Jewel by Violet Craft. I love the way that color tied things together. And dots always look nice in binding form, I think. I would have been finished with this quilt a little sooner had I not made really stupid mistakes with the backing. With the wide Ikea selvedges left on, the backing was exactly as wide as the top. So I went ahead and pin basted it without adding any wiggle room. Not a wise choice when you are planning to do this much quilting. So when I had the middle half of the quilting done and it became apparent that there was no way around that lazy decision, I had to take the pins out of the sides, trim off the selvedges and add on those long strips of dark gray. Re-baste. 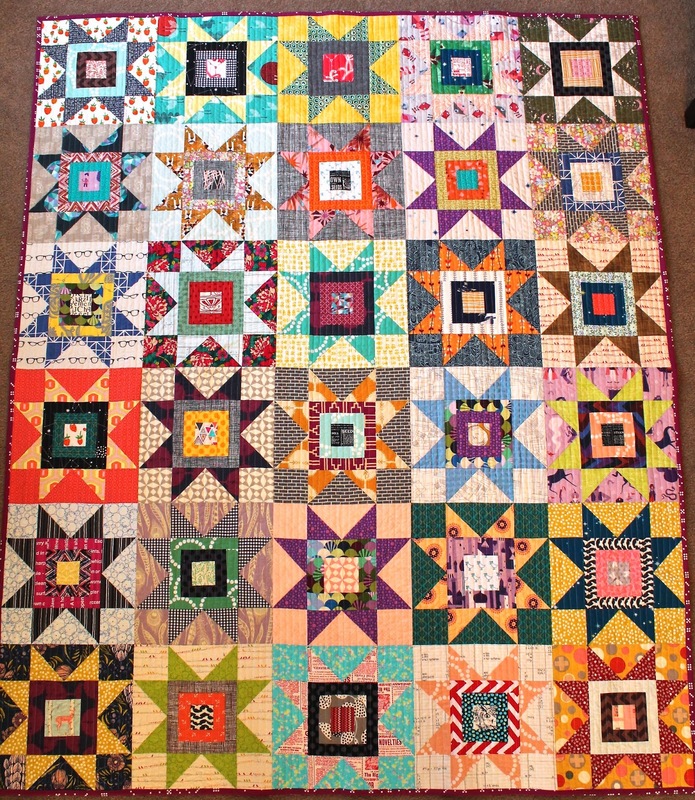 Finish quilting. Then, after all that, the bottom edge had shifted so that the backing didn't cover a little bit of the corned there. So aggravating! Such a rookie mistake to not making the backing a few inches bigger on each side. But I fixed it with a tiny sliver of quilt-as-you-go (pictured above), which didn't end up being very noticeable in the end. The quilt is a large throw, about 60" x 72". Ruth should be picking it up from her post office box any time now and I can't wait for her to get it! 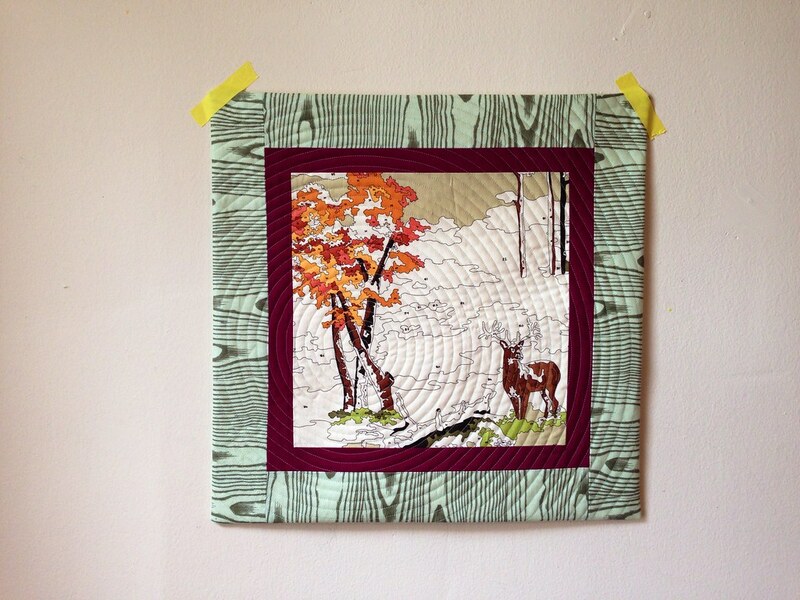 I'm entering this one in the scrappy category at the Blogger's Quilt Festival. I'd love to be nominated as a finalist because this is probably my new favorite of any quilt I've ever made. Even so, I was still happy to send it off to such a good friend who will really appreciate it. And it helps to know I will probably begin scheming up a new super-scrappy project to replace this one any day now. I can't resist the lure of my scraps. A few weeks ago I made this quilted pillow cover for my good friend Julie's birthday. She's actually my boss at Sewn and she's pretty awesome and she's the sort of person who probably hates that I'm even mentioning such things, but I'm doing it anyway. I always like to make her something for her birthday because she doesn't get to sew for herself very much. She is usually too busy teaching the whole city of Cincinnati to sew. Last year I made her this pouch to celebrate our shared love of Arrested Development, and the year before I made her a pretty sewing machine cover. The piecing here is simple, just a great print with a couple borders. 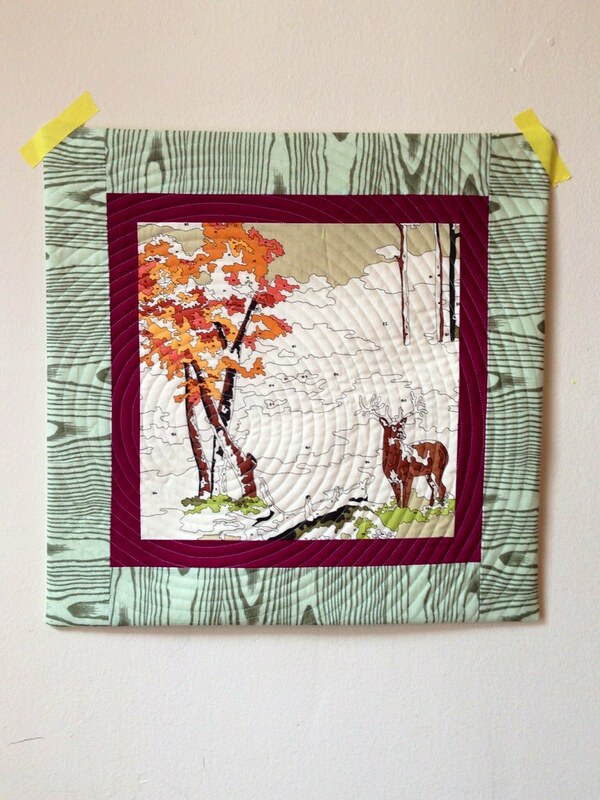 The deer and the woodgrain are from the line Lush Uptown by Erin Michaels, which I ordered from Pink Castle Fabrics. (I always feel like I need to use fabrics that Julie couldn't just pull off the shelves at Sewn herself to make something with. Foreign ingredients I guess.) The first border is just a Bella solid that I thought made the prints pop, but I don't remember the name of it. 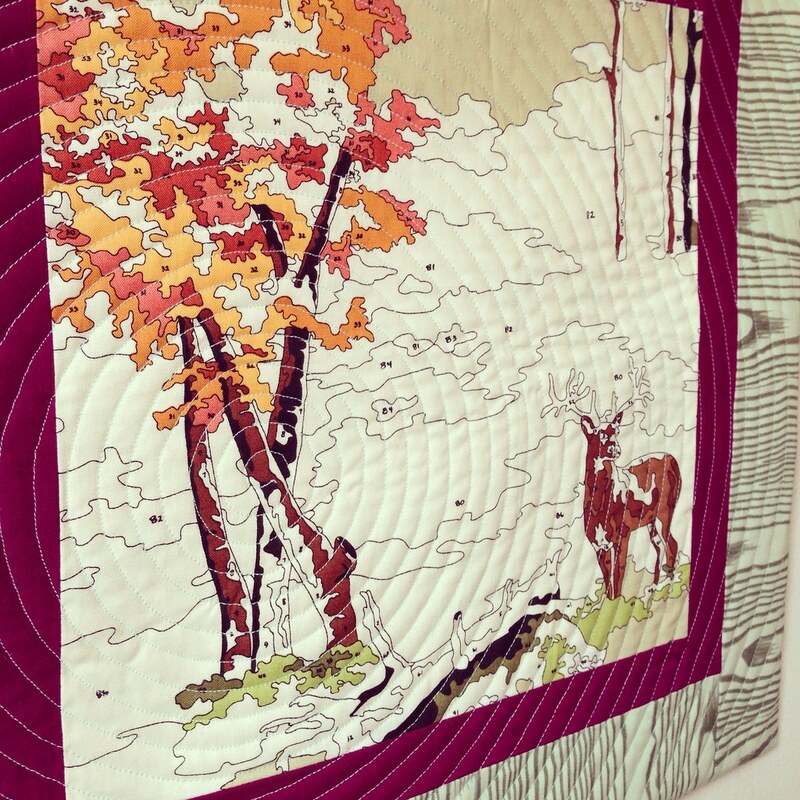 The quilting is my current favorite as you've seen here and here- spiral quilting! Especially easy and satisfying on something only 20" square. I kind of just randomly chose the middle of the tree to begin the spiral, and it wasn't until I got done that I realized it was a good thing I didn't start on the deer. Julie's not really a big hunter. I was scurrying to take a few pictures on my phone before rushing out to her birthday lunch and I didn't even have the time to put it on a pillow form. But the good news is that it looks great as a pillow and she liked it a lot. I bought Anna's Divided Basket pattern as soon as it was released, I think in February? I immediately printed the pattern pieces and started thinking of fabrics. Then I sewed it up in August. Yup, sounds about right. I didn't really have a purpose for making it, except that the CincinnatiMQG was having a fabric basket challenge thingy that month. Now it has become a holder of kid socks. Mismatched, can never find them where they are supposed to be, kid socks. How lucky am I that I have two kids who wear socks, and this thing is divided into two compartments?? Probably the best reason ever to round it out at two offspring. The main fabric is (again) Menagerie by Sarah Watson for Art Gallery. I actually made this project before making the Art Museum vest in the same fabric. And just last week I made a little bag for a CMQG swap with the leftovers. There are still some precious scraps that will be used to the last threads as well. It's just one of those fabrics you can't let sit on the shelf. I also used some Joel Dewberry woodgrain for the outside pocket, trimmed with peach Lizzy House Pearl Bracelets. My PB supply is dwindling, probably because I use them in everything. Must fix that problem. The lining is from Saltwater by Tula Pink. I think I got all three of these main prints at Cool Cottons during my trip to visit Kristin this summer. Didn't really mean for them all to go together to well, but they did. Love it when that happens! This pattern is fantastic, just like we always expect from Noodlehead patterns. The way the divider in the lining is constructed seems to simple in a way, but it's nothing I would have figured out on my own. It was so fun to see it come together. But my favorite part turned out to be the handles. I used this burlap-ish ribbon I got on a weekend trip to Columbus at a beautiful shop called On Paper. The store was mostly stationary and specialty gifts, but it also had this amazing little selection of the prettiest trims. For these handles, I just made piping out of the peach PB and sandwiched it between two layers of the cute ribbon. I love the way they look great on both sides and stand up so well. Details, details. I'm sure I'll be making a couple more Divided Baskets in the near future, as many of my friends are suddenly preggins, and they make great baby gifts you can stuff full of infant accessories. You can get your copy of the pdf pattern instantly right here. This is my last quilt finish for the do good stitches charity bee, at least for a while. It's a little sad to not be making fun plans for my next one right now, but I know I can always join the bee again down the road if the time is right. I just needed to simplify some things and make a little more time for my responsibilities as the Cincinnati Modern Quilt Guild president. Anyway, I can honestly say that my 2 years with the Harmony circle was so enjoyable and I would recommend this bee to anyone wanting to learn new things and give back with their quilting. It's really a wonderful project, and you can find out more about joining right here. This quilt was completely inspired by Amy of Badskirt's version that I saw here on Flickr. 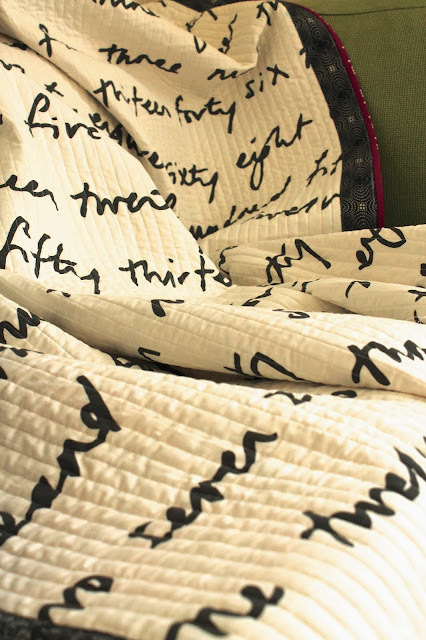 I instantly had a quilt crush on it. It's all kinds of amazing. So I told my group of stitchers to make Rocky Mountain Puzzle blocks using this tutorial, but I changed the measurements to make 12" finished blocks instead of 8." To do that, make the center square and HST units 3.5" with a 2" border around that center square. I said to use bright saturated rainbow colors, everything but purple. Not sure why I excluded poor purple, it's a color I love. But I'm glad it's left out in the end. You don't belong here purple! This quilt is so cliquey. Plus they could use black fabrics, and had to use low volume prints for the background of the blocks. The most fun part of this bee is when you start to get the blocks trickling in in the mail and you can imagine how they will harmonize in the finished quilt. It's so cool to see a bunch of scrappy blocks come together like this and really work. These two above are a couple of the blocks that I made. Everyone did a really great job at picking something fun to put in that center square. For quilting I did simple straight lines, following the diagonal direction created by the arrangement of HST's. It's fine enough, but I kind of wish I had done vertical straight lines, or maybe a crosshatch. If I'm being honest, I would do straight lines about 3/8" apart across every quilt I ever make if I had the time. That is one quilting decision I never regret. But in the end, this one just needed to be done quickly. This quilting does at least give is a really soft easy drape, which will be nice for this kid that gets it through Project Linus. The back has three extra blocks and a nice aqua Art Gallery print from Sewn Studio. I like how the little triangles scattered in it give a nod to the triangle design on the front. For the binding I chose an orange on pink dot by Kaffe Fassett. I loooooove the way his dots feel. It took me forever to settle on the binding for some reason, and I'm a little surprised I landed here. I must be having a hot pink moment lately.